The goal this month was very simple - try to create a game that's challenging, while also actively attempting to remain extremely relaxing. Whether that's the gameplay itself, or the visuals, or the sound design, everything needs to be focused on a calm, smooth, peaceful experience. I also wanted to try my hand at making a tiles-on-a-board puzzle style game, but I was dead set against falling into the old tired rut of match-3 gameplay. I wanted to make puzzles based on a ruleset I hadn't seen before. In the end, what I had was a puzzle game named Yì. 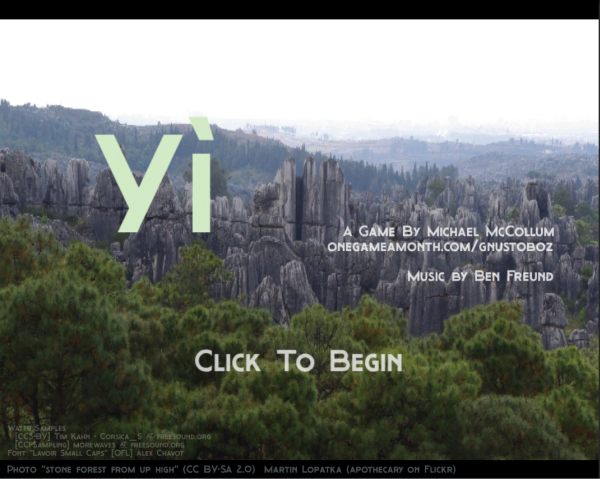 Let's get this part out of the way right up front - yes, the name of the game is Yì. Much of this game's presentation reflects a heavy Chinese influence. The tiles are based on the Wu Xing, and the music (provided as always by Ben Freund) is written to create an eastern-influenced mood. When I was trying to come up with a name that fit the theme and the presentation, I wandered across "yì" which, if the Internet hasn't lied to me, can be translated from Chinese as "unravel, clarify, find a solution." It fit both the mechanics of a puzzle game and the simplicity theme too well to pass it up. Making a game relaxing touches on a lot of different areas, and I wanted to make sure I made an effort to carry the theme through all of them. As a rule, few gameplay mechanics are as potentially relaxing as a puzzle. Take something that isn't the way it ought to be, and make it right. Simple, straightforward feelings of accomplishment. Who doesn't like that? 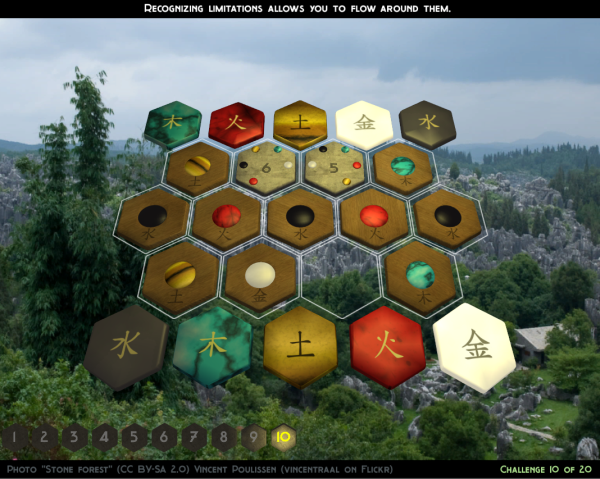 The first 8 puzzles are essentially an extended tutorial, introducing one rule at a time, with some help text displayed at the top to explain what the user is meant to learn. Every puzzle is solved by an arrangement of the tiles. All tiles are on the board and visible at all times, and clearing a puzzle always requires the same task: satisfying the requirements of the lock(s). The only obstacles in the game are locks, which have two potential requirements. They can require certain colored tiles to be present on certain sides, which is indicated by small stones on the lock, and they can require a specific number of tiles to be adjacent to them, indicated by a number on the lock tile. Each of these requirements is introduced separately, and they're the only requirements for all puzzles. Tiles can be picked up and placed on any empty space on the board, with only two limitations. Colored tiles (i.e. tiles that aren't locks) can't be placed adjacent to a tile of the same color, and solid-color tiles can't be moved at all. Each of these limitations is also introduced individually in the early puzzles. There are no time limits, no move limits, no "par" move count, and no bonuses for how fast or efficiently a puzzle is solved. Take your time. This was the tricky part. One of the easier ways to make a puzzle challenging is secrecy. Maybe you can't see all the components at once, or you can't easily see how one action will affect another area of the puzzle. Everything in Yì is right out in plain view at all times. There's no way to fail a puzzle. Nothing you do can't be undone, and every puzzle is always solvable. You never fail - you just haven't succeeded yet. Aside from the mechanics, the other obvious area where I wanted to try to keep things smooth and calm was in the presentation. That part was actually much simpler - when not worrying about game play implications, there's a lot more flexibility to just do whatever will make things feel more relaxing. Simple, straightforward, effective. Ben wrote some music specifically for this game, after seeing the initial artwork and hearing about how the game plays. Sets the mood, fits the theme, fades in and out like it's just part of the world around you. Better heard than explained, really. I knew going in that my best bet with the tiles themselves was to make them "feely," by which I mean presenting them as physical objects with realistic physical properties. I spent more time than I probably should have in Blender getting the tiles looking just right. Each corner of the hexagon is rounded a little differently. The edges taper a bit from the base. Everything is 3D, and a light source moves over the pieces as you play to accentuate the depth and angles. My usual intrepid music composer Ben also hooked me up with some custom sounds of tiles interacting with various surfaces, so each piece makes a quiet sliding sound when picked up, and a satisfying soft clunk when placed. There are several of these sounds, and each was played with minor pitch variations, to hopefully keep them from feeling canned and fake. As overused as it may be, for many (most?) people, our go-to theme for relaxation is nature. I wanted everything to be made of a recognizable material. The movable color tiles are wooden, and the locks are a simple grey stone pattern. For the colored stones, I found semi-precious stones that are naturally the required colors, and created textures based on each. Puzzles are presented with backdrops of Creative Commons licensed photos from various Flickr users. A photo credit is included for each. In addition, the ambient light and the color of the task light that moves over the pieces changes to fit each backdrop, and various ambient sound loops are added and removed to fit each. A panorama from high above may feature bird songs and wind, while a forest scene has crickets and flowing water. Nothing should ever be jarring. All transitions are fades through white or black. Text and backgrounds drift into place, and the board slides in and out of view between puzzles. Pieces rise up when picked, and fly to their new home when placed. Anything that moves or rotates does so gradually. Even the task light that follows your mouse movements over the board does so slowly to prevent the lighting from shifting too suddenly. Tile dimensions - all three dimensions of all tiles have a 5% variance when created. They'll still look pretty much the same, but not identical. Occasionally, you'll get a 105% right next to a 95% and you'll see the difference, or a tile with 105% height and 95% width that will look kind of squeezed, but in general it's too subtle to really notice. Initial rotation - all tiles are randomly rotated to one of their angles of symmetry. That way, details like the wood grain, or the bands on the tiger's eye pattern for the yellow stones, won't always run in the same direction, and the slight rounding differences won't always be on the same corners. Transient rotation - every time a tile is picked up or placed, the rotation varies by up to 3°. Again, usually not noticable, but occasionally it'll hit right on the +/-3° mark and it'll look a little off. Don't worry - if it bothers you, you can just pick that tile up and put it back down to get it back in line. Offsets - when a tile is placed, there's a slight variance in where it gets placed, so it's sometimes a little off from the center of the cell. Music Fade - the music itself fades gradually to become more and less pronounced, and then the periods of silence between sections of the song vary significantly in length, so sometimes it starts right back up, while other times it will disappear entirely for a while. If I want you to feel calm, but I'm giving you puzzles that aren't immediately solvable, that's a tricky line to walk, especially if I'm not keeping secrets from you. What you see is what the puzzle is, so there needs to be some feeling of progression as you move through the puzzles. That's easy enough for the first few puzzles, as the game teaches the player the rules and introduces the challenges one at a time. At that point, I needed a way to make the player feel like they're still learning without directly teaching them anything. All I can say here is that I hope I at least partly succeeded - I knew the tutorial puzzles were easy, and I knew a couple of the later puzzles are quite challenging until you learn certain things about how the board has to be laid out in order to find a solution, but the rest I just hope are reasonably difficult and not overly frustrating for players. I'm admittedly depending on the design of having no failure states to keep things from being too frustrating - you can never dig yourself into a hole. Not too bad, I think. I'm not sure a game could be much more peaceful and relaxing while still actually asking you to do anything, and despite having some difficulty coming up with puzzles, I think I ended up with an entirely reasonable set of puzzles which, at the end, are challenging while still being fair and giving the player a way to solve them without just blindly fumbling. The presentation was really the focus this month, along with making my first ever game of the pieces-on-a-board variety, and I think that worked out nicely.